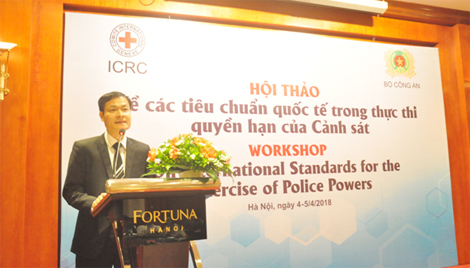 PSNews – The Ministry of Public Security (MPS) in coordination with the International Committee of the Red Cross (ICRC) on April 4 and 5 held a Workshop on International Standards for the Exercise of Police Powers. The event saw the participation of 30 delegates from various units under the two General Departments of Security and Police, Hanoi Municipal Police and educational and training institutions under the MPS. Mr. John-Erik Jensen, expert from the ICRC on issues related to security and police, briefed participants in the workshop on the challenges facing the police performances; ways to balance between ensuring humanitarian principles, citizenships and exercising police powers; the role of the ICRC in preparing police forces to join UN peacekeeping operations; and the rules and standards regulating the powers of the police force in controlling crowds. With 40 years of experience in various positions at the Danish Police, such as a Danish Police School faculty and expert at UN peacekeeping missions in many countries around the world, John-Erik shared with the Vietnamese delegates knowledge and experiences in applying international principles and law and international standards when exercising police powers in activities of international cooperation and legal assistance in crime prevention and fight as well as participation in UN peacekeeping operations in the coming time. 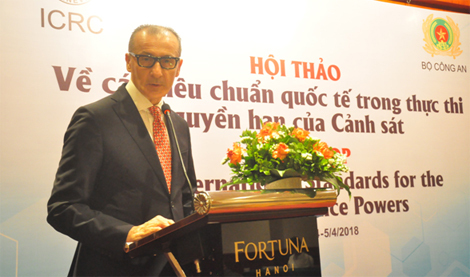 Colonel Le Duc Tuyen, Deputy Director of the Foreign Affairs Department of the MPS, and Mr. Gianni Volpin, ICRC Representative in Hanoi made closing speeches at the event.